Gov. John Bel Edwards on Monday called for a state constitutional amendment to raise Louisiana’s minimum wage to $9 an hour, as he opened the legislature’s annual regular session with calls for bipartisanship. "We’ve made tremendous progress in the last three-and-a-half years, not because of one party, not because of one person, but because many people from different parties have come together," Edwards said. "I am more and more convinced that there is far more that unites us than divides us." Constitutional amendments require approval of two-thirds of lawmakers in each body and a majority of voters, and the Republican-majority legislature has so far blocked Edwards’ attempts to raise the minimum wage. His call for a $9 minimum wage, to be effective July 1, 2020, is more ambitious than hiking the wage to $8.50 over two years, as he discussed publicly earlier this year. But Edwards asked those who have been reluctant to support a state minimum wage increase to give the people an opportunity to decide. Supporters say the $7.25 federal minimum wage, which Louisiana mirrors, is insufficient to support a family or get out of poverty. Opponents say the market should decide wages, and that a higher minimum wage penalizes low-skilled and younger workers by making them more expensive to hire, leading to job cuts and hour reductions. As Edwards noted, this was a very different speech than had opened prior sessions, without talk about the need to avoid a "fiscal cliff." Protracted negotiations over the state budget have led to seven special sessions over the past three years. "I am honored to join you for the start of what I hope and expect will be our only legislative session," he said, drawing cheers from the audience in the House chamber. Edwards portrayed a state that is on more solid fiscal ground than when he took office. Funding for higher education and health care is stable, the Medicaid expansion is saving lives and helping rural hospitals stay open, and the state is looking at a surplus, not a $2 billion deficit, he said. Meanwhile, the state’s GDP is at an all-time high, and over the past few years the state has landed more than 128 new economic development projects leading to more than 27,000 new jobs, retaining over 21,000 jobs and resulting in over $33 billion in new capital investment, he said. But the presence of Republican Congressman Ralph Abraham, who is running for governor against Edwards and was behind the governor along with several state elected officials during the speech, served as a reminder that election-year politics will be a factor throughout the session. The Republican Governors Association released a summary of what they called "the real state of the state," pointing to wage growth and employment numbers that are worse than the national average. "While John Bel Edwards attempts to peddle the fiction that Louisiana’s economy is on the right track, the numbers show that the State of the State is not strong," said RGA Deputy Communications Director John Burke. 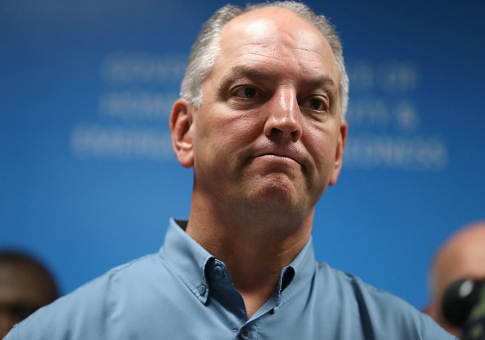 "Edwards’ job-killing tax hikes have hurt Louisiana, forcing working families to foot the bill for his big-government agenda as businesses flee the state, taking much-needed jobs with them." Truth In Politics, an anti-Edwards organization, took to social media to bash Edwards for raising taxes and overseeing a Medicaid expansion that "is running rampant" with waste, fraud and abuse. In June 2018, Edwards was joined by some Republican lawmakers in extending a portion of an expiring one-cent sales tax. Raising teachers' salaries by $1,000 and support personnel by $500 as part of a multi-year process to bring teacher pay to the regional average, along with a 1.375 percent increase in the per-pupil state allocation. Expanding opportunities for dual enrollment in college courses to every qualified high school junior and senior. Prohibiting employers from taking action against employees who discuss their own wages or inquire about other employees’ wages. The hope is that this policy would help to prevent wage discrimination. Protecting access to insurance for people with pre-existing conditions, in case federal laws doing the same are overturned by the courts. Upgrading water systems around the state that are in danger of failing. Adopting a "Veterans First Business Initiative" creating a "veteran-owned business designation" and developing a website for Louisianans to search for goods or services from veteran-owned businesses.